Haaviku Nature Lodge i Lahemaa Nasjonalpark, Estonia: Bestill nå! 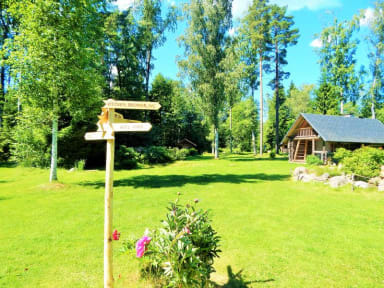 Haaviku Nature Lodge is located in Estonia, Tepelvalja village in Lahemaa National Park. Our trademarks are 'nature' and 'privacy'. Three cabins, sauna and summerkitchen are situated on the side of a small river. It is 85 km to Tallinn and 30 km to Rakvere from here. Nearby you can find lot of to do and see: there are nature trails, lake and seashore, famous manorhouses in Sagadi (2,5 km, forest museum), Palmse (8 km) and Vihula (8 km, SPA), tavern in Altja fisherman-village and sea-museum in Kasmu. 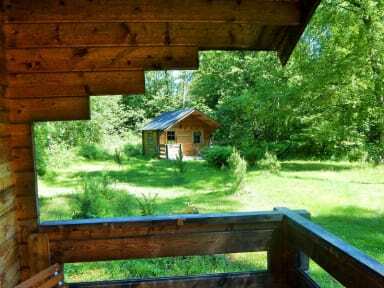 We offer accommodation in small wooden cabins for up to 3 adults. There is a small refrigerator in each, a kettle, tea and coffee (Nescafe) and a hairdryer. You can prepare breakfast on your own in the summerkitchen (all equipment needed) or have it in Sagadi Manor restaurant. You can fish by the Oandu lake or rent our bikes and just ride around. After a day full of emotions we can heat up a traditional Estonian sauna for you. From July till October blueberries and muchrooms are waiting for you in forests and in August-September you can watch cranes flying over our garden every morning and evening.